Eastern senior Mackenzie Brooks (11) spikes the ball over the net in front of teammates Morgan Baer (15) and Allison Barber (right), during the Lady Eagles’ 3-0 win over Miller on Tuesday in Tuppers Plains, Ohio. TUPPERS PLAINS, Ohio — The Lady Eagles are certainly playing the right way at the right time. 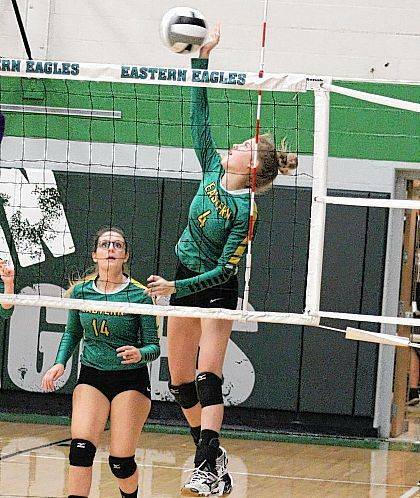 The Eastern volleyball team began the final week of the regular back-to-back straight games victories, defeating Belpre on Monday and Miller on Tuesday in Tri-Valley Conference Hocking Division action at ‘The Nest’. 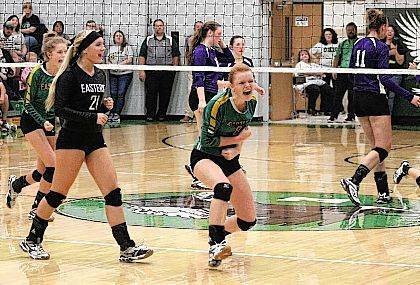 On Tuesday, Eastern (14-7, 11-4 TVC Hocking) — which has now won six straight matches, all in straight games — avenged a 3-2 loss to the Lady Falcons (13-8, 10-5) from Sept. 19 in Hemlock. In Tuesday’s opening game, Eastern took the advantage at 2-1 and never trailed again, leading by as many as nine points en route to the 25-17 victory. In Game 2, the teams fought through a dozen ties and six lead changes. Miller had the game’s largest lead of five points, and the Lady Falcons worked their way into a game-point situation at 24-23. The Lady Eagles claimed the next three points, however, swiping the 26-24 win to move ahead 2-0 in the match. The Lady Eagles took the lead at 3-2 in the third game and didn’t relinquish it, leading by as many as 15 points on their way to the match-sealing 25-11 victory. Morgain Little led the Lady Eagles with eight service points, including four aces. Alessandra Martella and Mackenzie Brooks both finished with seven service points, with Martella earning five aces. Morgan Baer and Allison Barber claimed six points apiece, with an ace by Baer, while Elayna Bissell and Sydney Sanders both marked five points and one ace. Brooks led the Green, White and Gold at the net with with 12 kills and one solo block. Barber posted six kills and five blocks, Jenna Chadwell added six kills of her own, while Little finished with four kills and two blocks. Kelsey Casto contributed one kill to the winning cause, while Baer picked up two blocks and a team-best 25 assists. The Lady Eagle defense was led by Barber, who earned 17 of the team’s 59 digs. For the match, EHS finished with five serving errors and nine attacking errors. Miller was led by Ryleigh Newman and Josie Perani with six service points apiece, including four aces by Newman and one by Perani. Olivia Houk and Haille Joseph finished with five three points apiece, with a pair of aces by Houk. Lacey Alexander and Josie Crabtree contributed two service points apiece, while Brooklyn Wilson earned one point on an ace. Houk led the MHS net attack with 11 kills, followed by Crabtree with 10. Newman and Perani both had two kills, with Perani earning 23 assists. Alexander led the Lady Falcon defense with 21 of the team’s 43 digs. 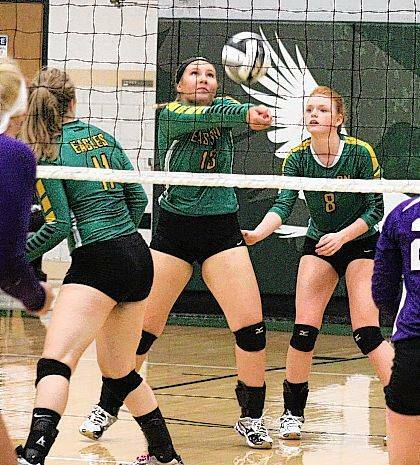 On Monday, the Lady Eagles defeated Belpre in straight games, by counts of 25-8, 25-15 and 25-12. EHS never trailed in the first or third games. Eastern was led by Baer with 11 service points against BHS. Martella, Little and Chadwell each had nine points, with three, two and one ace respectively. Brooks marked six points in the win, Barber added three points and one ace, while Sanders chipped in with two points. At the net, Brooks led the Lady Eagles with 10 kills and three blocks, followed by Little with six kills and one block. Barber and Chadwell both marked five kills, with two blocks by Barber. Baer and Casto had two kills apiece, with Baer earning two blocks and a team-best 28 assists. Barber led the Lady Eagle defense with eight of the team’s 38 digs. As a team, the Lady Eagles finished with three serving and 14 attacking errors. 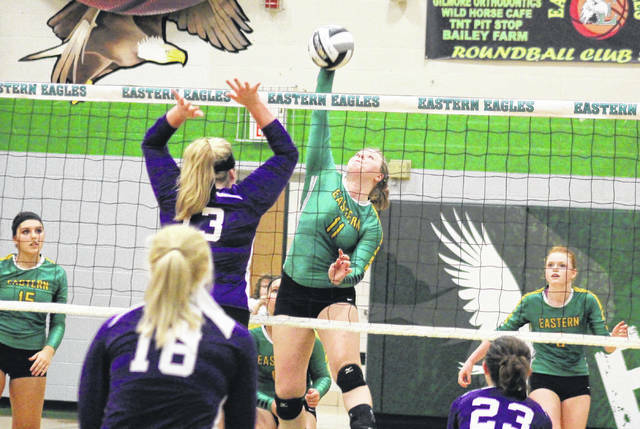 Eastern also defeated the Lady Golden Eagles in straight games on Sept. 18 in Belpre. Thursday’s match at Trimble will be the Lady Eagles’ league finale as well as their last regular season match.